The sprawling complex at Kamra, west of Islamabad, reverbates at the thundering take-off of a Mirage Rose-1, the latest ageing fighter jet to have been gutted and reassembled by the Pakistani Air Force. That includes one of the first two planes originally purchased from France's Dassault in 1967, which was in a hangar at Kamra after its record fifth overhaul when AFP visited recently. The techniques they have developed are reminiscent of -- but far more high-tech and lethal than -- the improvised methods used to keep classic American cars running on the streets of Havana. "We have achieved such a capability that our experts can integrate any latest system with the ageing Mirages," says Air Commodore Salman M. Farooqi, deputy managing director of the Mirage Rebuild Factory (MRF) at the Kamra complex. 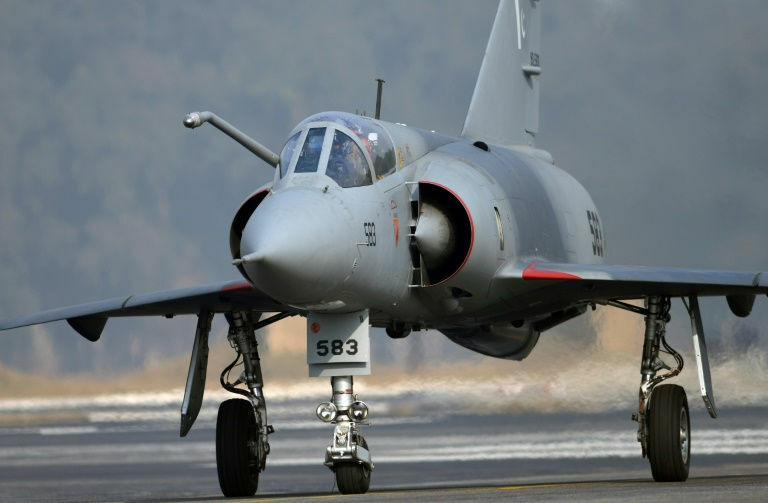 Pakistan bought its first Mirages to diversify its fleet, which in the late 1960s largely consisted of US-built planes: F-104 Starfighters, T-37 Tweety Birds and F-86 Sabres. The Mirage became a popular choice, with the Air Force buying 17 different variants in later years, eventually owning the second-highest number of the fighter jets after France. They performed bombing missions during Pakistan's failed war with India in 1971 -- one of the shortest conflicts in history, lasting just 13 days and leading to the creation of Bangladesh. But Mirages flew on, also carrying out reconnaissance missions in India, and intercepting and shooting down Soviet and Afghan planes that violated Pakistani airspace during the Soviet war. Usually the jet has two or three life cycles, each spanning around 12 years. But overhauling them abroad was expensive for Pakistan, a developing country whose budget is already disproportionately tilted towards its military and which has historically received billions in military assistance from countries such as the US. So, with the help of experts from Dassault, the air force decided if you want something done for the right price, you've got to do it yourself. The Mirage Rebuild Factory was established at the Pakistan Aeronautical Complex (PAC) in 1978, and in the years since has saved "billions" of dollars for Pakistan, according to Group Captain Muhammad Farooq, in charge of one of the maintenance hangars -- though he said the exact figure was difficult to pin down. Engineers and technicians were dismantling cockpit instrument panels and landing gear while undertaking a "non-destructive inspection", essentially an X-ray to detect faults in the wings and airframe. Pakistan has also been buying up discarded Mirages from other countries to bring through the facility, said retired Air Marshal Shahid Lateef. Also read: How can businesses tackle sexual harassment? The most important technological improvement, developed with the help of South Africa, is the ability to integrate air-to-air refuelling, Farooqi said. The "identification of friend and foe" (IFF) system, which detects when a Mirage has been locked on to by the system of another plane, was also a key development, he said. But even with the improvements and cost-saving measures, the ageing planes are becoming more difficult to maintain. "They have outlived their lives... after their overhauls (they) have become highly unreliable, we even met with lots of accidents," Lateef said. The best option to replace them would be the Rafale, as neighbour and arch-rival India -- which has also flown and maintained Mirages for decades -- is doing, signing a deal with Dassault in 2016. Even as it becomes more urgent to phase them out, Mirages' status as the grand dames of Pakistani military aviation cannot be dismissed, Yazdani, who has logged 1,500 hours flying them, told AFP. It is a "very agile aircraft capable of penetrating deep into the enemy's territory without being detected by radar, which makes its sole mission -– to drop bombs on the enemy's position -– quite easy," he said. "It is an old aircraft," said aviation writer Alan Warnes, author of two books on the Pakistani air force. "But Pakistani pilots have been flying this plane with the utmost accuracy and expertise." 0 Response to "Thrifty at 50: Pakistan keeps ageing Mirages flying"